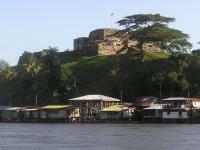 Fortress of the immaculate Conception is part of the Tentative list of Nicaragua in order to qualify for inclusion in the World Heritage List. The Fortress of the Immaculate Conception is better known simply as “El Castillo” after the small village over which it towers, and should be on the “see list” of anyone visiting Nicaragua, both for its own merits (even though it doesn’t seem possible that, at the time of its construction, it could have been the “second biggest fortress” in the entire Spanish American Empire!) and for the scenery of the San Juan River area alongside which it is situated. The San Juan flows out of Lake Nicaragua into the Caribbean. It is navigable (despite the several rapids) and, historically, was used as a route to enter the lake itself from the sea, including by pirates such as Henry Morgan – indeed the historic city of Granada on the west side of the lake was plundered on several occasions. It was to prevent this that the Fortress was built in 1675. In 1780, the then 21 year old Captain, Horatio Nelson was part of an expedition which captured the fortress as part of an unsuccessful attempt to capture Granada and Leon and thus split the Spanish empire and give access to the Pacific after Spain had joined the anti-British coalition during the American War of Independence. The next time the area surfaced in world history was as part of the route by which people reached California during the 1848-55 gold rush with the steamer service run up the San Juan River by Cornelius Vanderbilt - this led to the river and lake being seriously considered as the route for the trans isthmus canal ultimately built in Panama. Indeed the possibility still exists today though a rail route further north known as the “eco-canal” seems to be the current favourite approach. We visited the area in 2005 and remember it very positively. Your initial problem is how to get to the town of San Carlos at the start of the San Juan River. As we had returned our rentacar to Managua we flew in from there on a small single engined plane to a dirt airstrip – alternatives are a 9+ hour bus ride over rough roads from Managua or a 15 hour ferry journey across Lake Nicaragua from Granada. But at San Carlos the roads end and you have to take to the small but speedy motorboats known as “pangas”. El Castillo is about 2hrs downstream – a delightful journey. The fortress is nicely situated overlooking the village (Photo) with fine views from the top but will only take a couple of hours max to explore, including its well presented museum. Another 25 minutes downstream lies the first entrance to the Indio-Maiz reserve at Rio Bartola. You need a guide to enter at this point but these are readily available in El Castillo. You could spend half or a full day if you wished walking the trails but, in all honesty, we have had better trips in other Central American forests – perhaps it was a matter of weather and luck! I have no doubt that the reserve is important/significant but we saw no “iconic” animals or birds in our short visit and were already well versed in “basic” forest ecology. The subsequent trip we did further down the river was more rewarding. I understand that longer camping/canoeing trips are available into the reserve – in particular from the upmarket Rio Indio Lodge further downstream. Apart from that it is a matter of chilling out, watching the river pass by, eating the superb freshwater prawns (called “shrimp” or “camarones” here) and meeting the locals!! Nicaragua is full of surprises and interest – our hotel manager had been a senior Sandanista and our fellow passengers on the flight back were Miskito Indians who had fought as “Contras”! But will it get inscribed?? Well the linkage of the Indio Maiz-NP and the Fortress in a single nomination seems contrived and unjustified. If the NP has OUV it is for being “unspoilt” so why include a man-made structure? The Fortress is interesting and has a, possibly under-valued, historic significance in the development of Spanish America but I wonder if the bar for new inscriptions of such structures is now set somewhat higher than this site can achieve. It was renovated with Spanish help in 1995-7 so is presumably “ready” regarding that aspect. My Footprint guide book, dated July 2005, says that it is “soon to become a World Heritage Site” – but the 2008 edition has downgraded this merely to “tipped to become a WHS”!! Another Web site says that it is “now peacefully awaiting its nomination for UNESCO World Heritage Site”. I can find no indication on the Web of any activity – Nicaragua tried to get Leon Cathedral inscribed in 2008 and has work to do to resolve the issues which led to its referral so may have its national attention focused elsewhere. And what of the Indio-Maiz NP by itself? Well the IUCN evaluation “The WH List - Future priorities for a credible and complete list of Natural and Mixed sites” did NOT identify the neo-tropical areas of Mesoamerica as being a significant gap (Madagascan forests and the Western Ghats WERE so identified and the first has gained inscription and the second seems about to!). It would seem most likely that conservation activity for Indio-Maiz will continue, for some years at least, on the basis of the CBM rather than going for WHS inscription?